Even before I started beekeeping, I noticed that anytime I had herbs flowering in the garden, the bees would always be all over them. 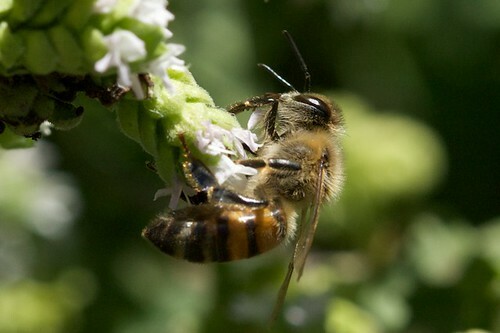 Herbs like mint, rosemary, thyme, and oregano have tiny little flowers but the bees really seem to like them. 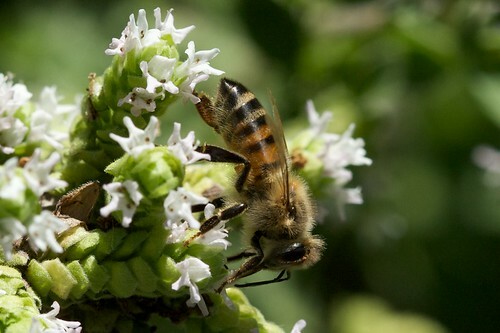 Right now, oregano is in bloom where the hive is located, and the girls are taking advantage of a close nectar source. It turns out I was only able to take off 4 frames of honey this week instead of a full eight because I accidentally put the wrong super in the top position yesterday which was extremely frustrating. All in all, I think the mistakes I have made so far have been relatively minor and has not hurt the hive in the long run. 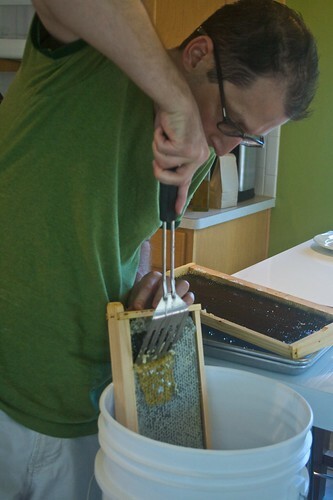 This time I extracted the honey at the site of the hive so I could put the frames right back in to be cleaned up by the girls. 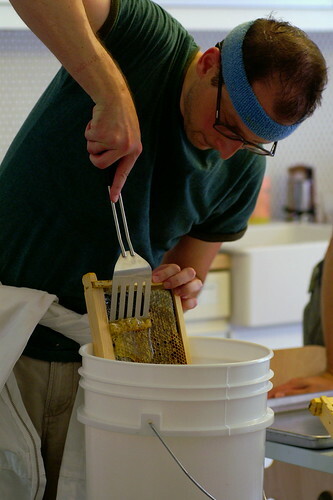 Also, the honey is extracted a lot easier when wearing a baby blue headband that gives +2 against spills. Last week I tried cleaning the frames and that didn’t work at all. 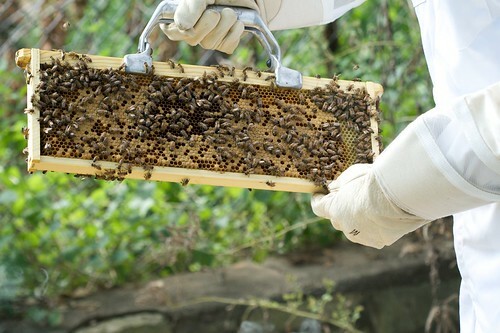 Anybody know what the best thing to do with frames after extraction if you can’t get back to your hive right away? 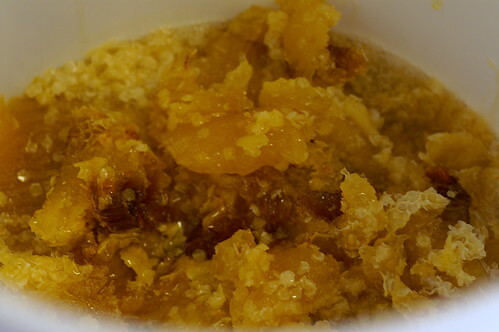 I also got another batch of wax cappings and comb that I will process in the next week or so after I build a solar wax melter. I’m going to try the low cost version from Linda’s Bees blog. I figure it gets above 95 most days here in Austin in the summer time so this version will work well here in the south. There was a bit more pollen in these frames which is the darker stuff in the middle of the photo. 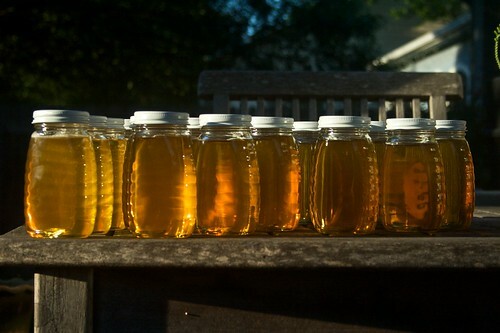 All in all, I got about another 20 pounds of honey this week. My expectations for the first year were little to no honey so kudos to Large Marge and crew for doing so well. If I can just keep them from swarming this first year, everything will be going great. 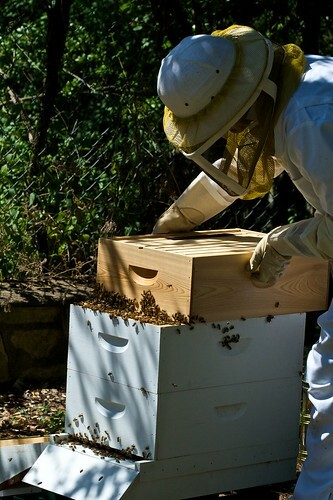 Almost every book I’ve read on starting your first hive basically says that more often that not, you generally don’t have to worry about swarming in your first year of beekeeping when starting from scratch. There are exceptions to everything, and I think Large Marge’s hive is getting close to swarm potential. I found more than 6 queen cells in the hive with one frame having 4 in the 2nd super. I think part of the problem is the girls have decided that supers 1 and 2 are for brood and 3 and 4 are for honey. So to try and prevent a swarm, I added a super with all new frames into the 3rd position effectively making the 4th and 5th super the honey supers. I’m hopeful this wide open space in the 3rd slot will give them the room they need and discourage a swarm. I also added the bee escape between the 4th and 5th super to pull some more honey off tomorrow to also open up some space in the hive. I actually moved what was the 3rd super to the top position because it was all capped honey. 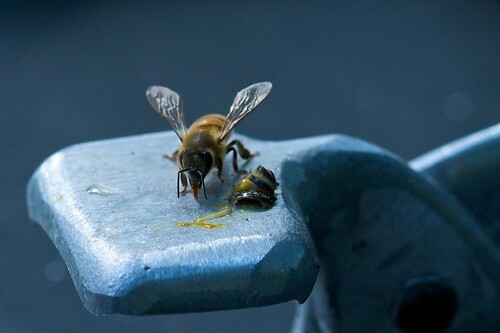 Here is a shot of the bee escape. Large Marge still is performing well and I’m seeing good brood patterns in the 1st and 2nd supers. 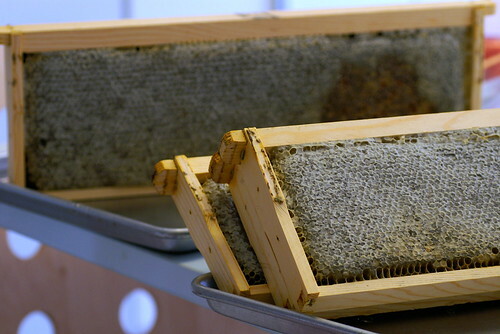 The also have been quickly building out new comb on the new frames that were put in last week when I removed a few frames of honey. Here is the hive put back together which now consists of 5 supers. I’ll be back tomorrow to remove probably at least 4 frames of honey and take off the bee escape. The one thing all the books I read and even the class I took didn’t prepare me for was squishing bees. 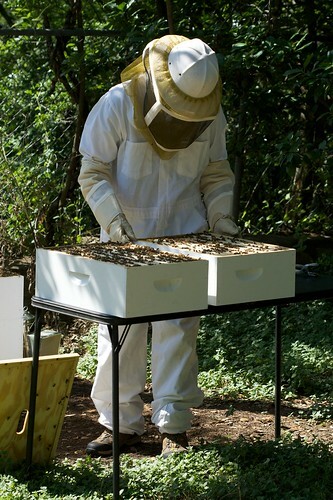 No matter how careful you are, some girls are just going to get squashed in the process of inspecting your hive. 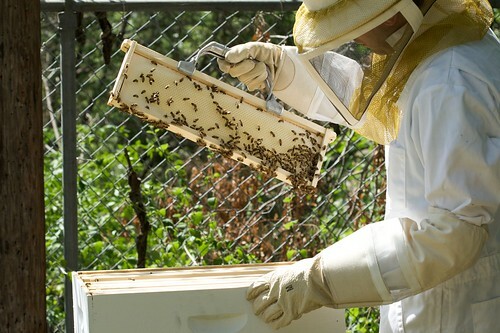 You can certainly minimize the damage by moving slowly and carefully, but as bees are in constant motion, causalities are always an occurrence. It makes me sad every time it happens though. Sunday afternoon I checked on the hive to see how the bee escape was working. After 36 hours, almost all the bees were out of the 4th super which let me easily harvest 3 full frames of honey. For some reason, I thought there were at least 5 frames ready in the 4th super, but I was mistaken. That will teach me to take better notes next time I inspect my hive. I replaced the frames I removed and then took off the bee escape. The girls looked super crowded being forced back into just 3 supers so I’m sure they were happy to get back in the 4th again. I setup my harvesting station in the kitchen. 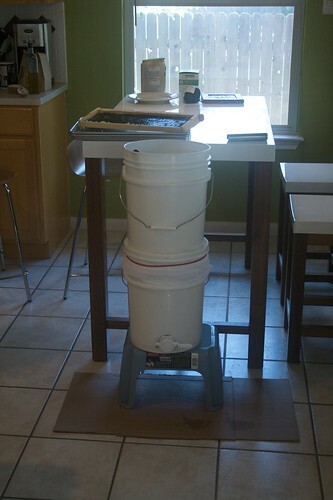 I have a two 5 gallon bucket system that I purchased from Brushy Mountain that strains your honey as well as having a honey gate to allow you to bottle. 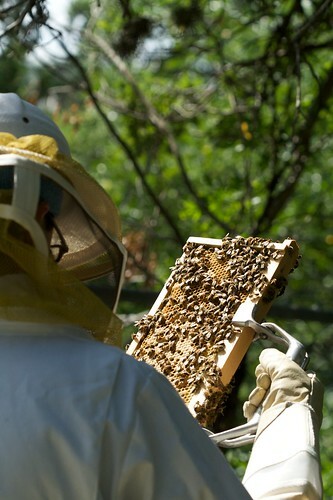 For this type of extraction, you scape off the comb and honey into the first bucket. Here’s a closer shot of the sweet sweet honey on the frame. 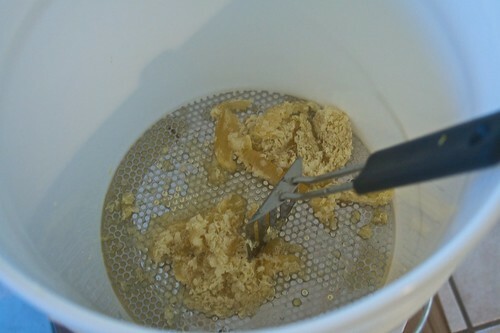 The top bucket has a sieve that catches the wax cappings. I saved those to be melted at a later date to get some beeswax. I put it in a baggie and stuck it in the freezer. 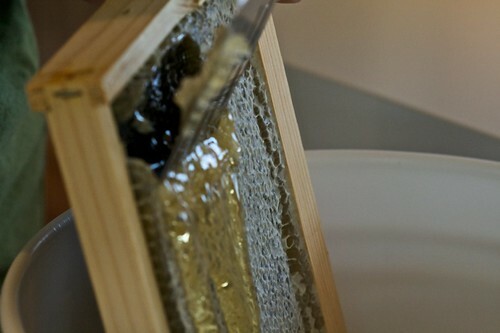 The honey goes through the sieve and then through a nylon mesh bag for further straining. 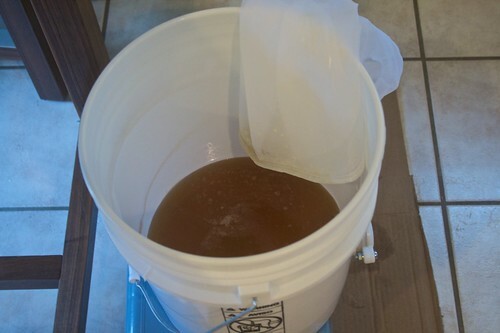 After that it ends up in the bottom bucket ready to be bottled. After that you can bottle the honey. Three full frames got me 21 8 oz. bottles of honey. Considering the 3rd super is all honey and the 4th is well on its way as well, I need to get a lot more bottles here quickly. My fears of Large Marge’s untimely demise were quickly put to rest after this week’s inspection. I found plenty of capped brood, larvae in various stages, and cells full of eggs in the 2nd super. The girls have decided that supers 3 and 4 are just going to be honey which makes the whole debacle with the queen excluder even more absurd. I didn’t bother checking the 1st super as I want to start minimizing my time in the hive, and I need to trust that the girls know what they are doing. 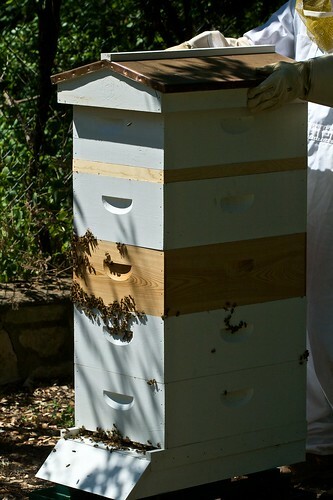 After lifting supers filled with honey the last two weeks, I decided my back was never going to last unless I implemented some bee yard ergonomic improvements. A card table next to the hive eliminated having to put the supers on the ground. 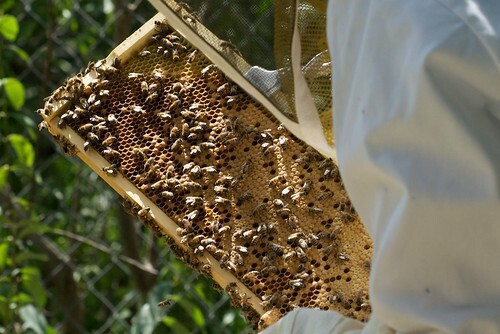 I was pleased to see a lot more frames that had capped brood with empty cells already containing eggs or larvae. I think I also finally found a good angle and position of the sun to see eggs more clearly. You definitely want the sun hitting the frame directly so the cells get illuminated. Having the black plastic foundation also has been an advantage. With supers 3 and 4 almost all honey, I decided I could safely harvest some. I put an escape screen between supers 3 and 4 to clear the bees out the 4th super. 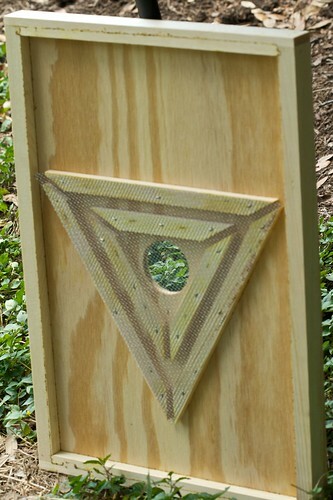 An escape is designed to let bees go down into the hive, but prevents them from moving up. The fewer bees you have in the super you are trying to harvest the better for obvious reasons. I’ll check back tomorrow afternoon to see how many bees are left.